A recent story in the Wall Street Journal (subscription only) touches on a new breed of startups that aim to make eating in the future an easier, healthier, and more vegetarian experience for you. Hold up, techies! What about those of us who still want to eat delicious meat? The biggest development in lab-engineered food comes from a startup called Impossible Foods, founded by biochemistry scientist Patrick Brown, where engineers and scientists are experimenting with how to make replica "plant blood" ooze from a veggie burger, similar to what you'd get if you were eating real cow's beef. Mmm! Impossible Foods has amassed $75 million in venture capital, including support from Bill Gates. A large bulk of that money has gone into Mr. Brown's manufacturing facility in Redwood City, Calif., a sort-of Willy Wonka lab for fake meat where white-coated lab technicians dump large vats of fresh spinach leaves and other plant matter into a giant blender that breaks down the greens into plant proteins. Elsewhere, machines rapidly cook raw ground meat and send blasts of smells to scientists, who carefully log the characteristics and strength of each smell. And all across the lab, several tests are happening concurrently, some dedicated to improving the flavor, texture and smells, and others designed to improve the cost efficiency of its processes. 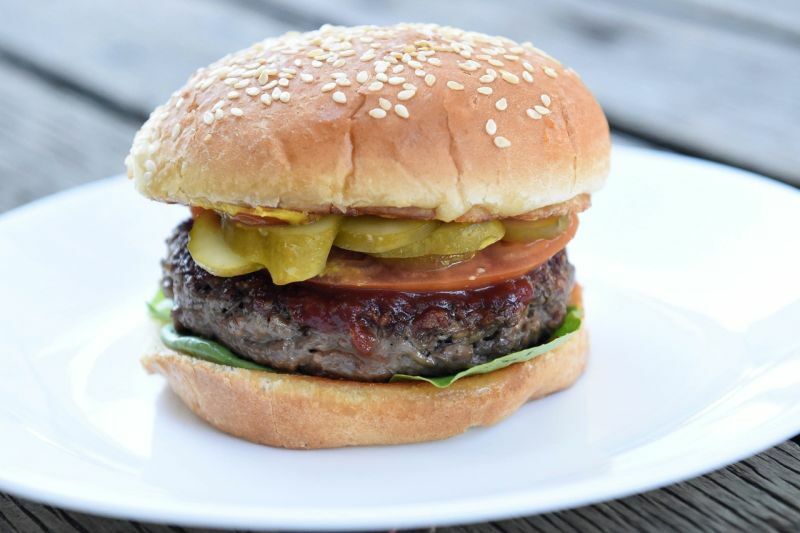 What Brown wants to discover with his venture is not just a better veggie burger, but the science behind what makes meat taste the way it tastes and what makes it smell so delicious and good and why we want it so much. How do you convince a person who doesn't want to eat anything but meat to eat a stupid substitute? One of the most important findings was the role that heme plays in meat flavor. That molecule unlocks flavors when it is exposed to sugars and amino acids, giving cooked meat its distinct taste. The resulting patty apparently looks, smells, and tastes (no way) like a real burger, blood and all. Well, maybe more like a turkey burger, the WSJ exclusively reports. The result is a dark red patty that looks and feels like raw ground beef and transforms as it cooks. During a demonstration with the Journal, the patty gradually browned and caramelized on the grill, releasing oil from fats and producing the smell of cooked meat. In the mouth, the patty pulls apart the way burger meat does. The taste isn't perfect, though—arguably several rungs below a gourmet burger, and more akin to a turkey patty.